If you are a resident of New York planning to purchase a car, expect to handle some paperwork in order to register and title the car in your name. If you are planning to purchase the car from a New York dealer, they will handle all the required paperwork on your behalf. However, if you intend to use a private seller, be ready to handle paperwork for registration and titling yourself at the New York Department of Motor Vehicles (DMV). Continue reading this article to get more information about the paperwork required when buying a car in New York. Proof of vehicle ownership. If you intend to purchase a vehicle built from 1973 onwards, you need a bill of sale and title signed over to you. If you intend to go for vehicles older than 1973, you need to obtain the transferable New York registration or proof of ownership if you are purchasing the car from another state. Damage disclosure and odometer reading statement. If the back of the title doesn’t have space for this information, use Form MV-103. Vehicles older than 8 years do not require damage disclosure and vehicles older than 10 years do not require odometer reading. Proof of purchase price or gift. Lienholder’s original document to show that the lien is satisfied. Examine the title certificate carefully to see whether there are any unsatisfied liens. At this point, you don’t need to worry about paying sales tax. You will pay tax at the time of vehicle registration and titling. 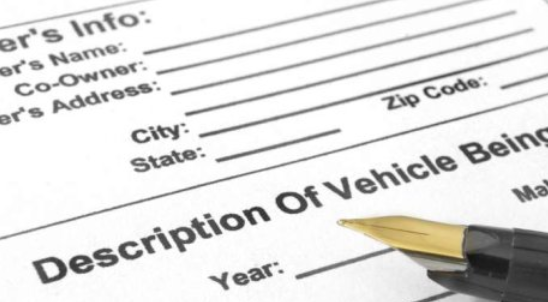 When you purchase a vehicle through a dealer, they will handle the required documentation on your behalf. The unopened returned certified letter. Police statement, pencil tracing or a photo with the VIN. A notarized affidavit explaining what happened. Any other proof of ownership, like bill of sale or cancelled check. A completed Form MV-51B (Statement of Ownership for Non-Titled Vehicles, All-Terrain Vehicles, Boats and Snowmobiles). If you need more information or have any question, contact the New York Title Services Bureau through hotline (518) 486-4714. A bill of sale is required when registering and titling the car in your name. A Vehicle History Report is not mandatory when titling or registering your newly bought vehicle. However, this document is needed when it comes to buying a car. This document contains a detailed history about the vehicle you are buying. It contains information based of the car’s VIN, such as odometer reading, accident history, past damage etc. A Vehicle History Report will help you determine whether you are buying a vehicle which is in good condition.